A man by the birth name of Lars Lannerback once brought a neo-classical touch to metal that influenced thousands, even millions of metal heads around the globe once. You know this man better by his artist-name, Yngwie Malmsteen. Since then, the genre has seen massive over-saturation, to the point where nothing new could quite be offered. Some bands are able to make the used things sound rather fresh. 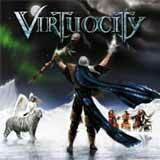 Finlands Virtuocity is one of those bands. Led by ex-Kenziner guitarist Jaron Sebastian Raven, Northern Twilight Symphony is Virtuocitys second album. Where the debut, Secret Visions was more like a project record, with Raven and several top players from the metal scene (Marco Hietala and Jaska Raatikainen to name a few), this record has a stable line-up, that has already toured as a unit. That can be heard on the record, as the playing is much tighter then on the debut. Singer Peter James Goodman provides excellent vocals, that are delightfully different from the usual falsetto-screechers and Halford-copies of todays melodic metal scene. His voice recalls more Dio and Ian Gillan, the 70s soulful crooners, as his voice is quite “bassy” and doesn’t go that high on the record. More strength than flash would be a good way to describe it. Ravens guitar playing is straight in the vein of Malmsteen, with the Classical-meets-Metal –style perfected to an L. But he doesn’t thankfully cross the line to self-serving noodling too often. He mostly plays less than 20 notes per second:) His compositions work also well, as the lack of excessive soloing lets the songs have more life, and you don’t tire with them that quickly. The keyboards also have a large part in the songs, as they often either harmonize the guitar or provide very classical and Bach-like backgrounds. The production on the album is the greatest weakness, though. Its not St.Anger- level, no fear there, but the rhythm section still sounds a bit weak, as if the guys didn’t have enough time mixing the record. Who knows. The song material is quite mixed. There are great tracks among here, but also a couple of fillers that just don’t take off at all. The speedy double-bass-metallers Flames In The Sky and Wheels Of Time should get any neck spinning in a jiffy, while the heavy ballad Within My Heart provides some nice evening music. I have to be a bit patriotic here and say that the Finland-tribute Land Of A Thousand Lakes is also very good as is the heaviest groover on the album, Shaman Beat. Then again, tracks like Forever Young and Light In The Dark are buried onder their own generic weight, and just don’t cause anything with me. Still, any fans of Rainbow and earlier Malmsteen should eat this up like Christmas ham. To everyone wanting neo-classical metal with more sense of style then the “solo-is-the-only-part-of-the-song-that-matters”-bands that are a dime a dozen, listen to this, I think you will like it. Everyone else, give it shot. This album is nothing new in the metal scene, but it is quite skilled and tasteful stuff in its respective genre.